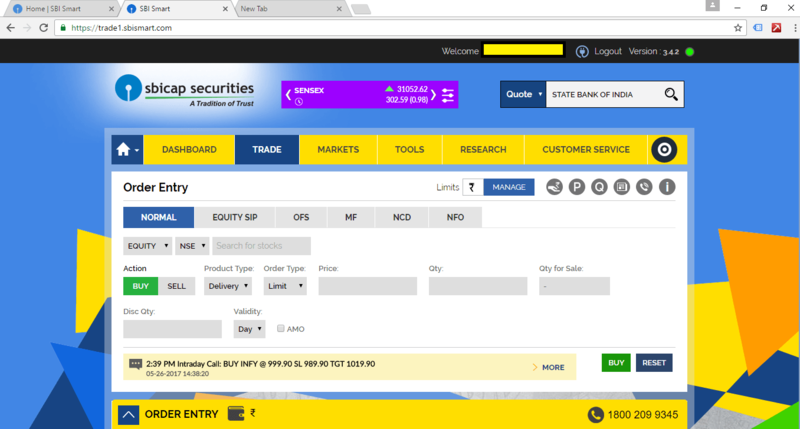 SBICAP Securities offers 3-in-1 account which is an integrated platform of Savings Bank A/c, Demat A/c and an Online Trading A/c. Its broking product range covers Institutional and Retail Equity, Derivatives, Depository Participant services, Online trading and a wide variety of Third Party Distribution products. SBICAP Securities Ltd (SSL) is the stock broking wing of the state bank group . SBICAP Securities Ltd started incorporated in the year 2006. It is also subsidiary of SBI Capital Markets Ltd. The product range is a long list including institutional and retail equity, depository participant services, derivatives,online trading.etc. It offers the best services in Mutual Funds, IPO, NSE and BSE in the segment like Equity Cash, Equity Derivatives, Currency Derivatives. SSL offers a single brokerage plan to trade in the market. Intra-day Trades: 0.15% (both sides) or minimum 5 paise per share whichever is higher. Delivery Based Trades: 0.50% or minimum 5 paise per share whichever is higher. Futures: 0.06% for intraday and 0.08% for carrying forward or minimum 1 paise per share whichever is higher. Options Trades: Rs 50/- for intraday (one side) (per contract) and Rs. 100/- for carry forward (per contract). The brokerage structure is simpler to understand but the charges are huge compared to the competitors in the same field. 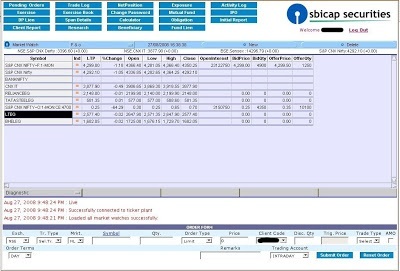 SBICAP Securities supports all the three modules of trading platforms i.e. terminal based, web-based and mobile app. If you are a heavy volume active Intraday trader, we cannot gaurantee satisfaction. 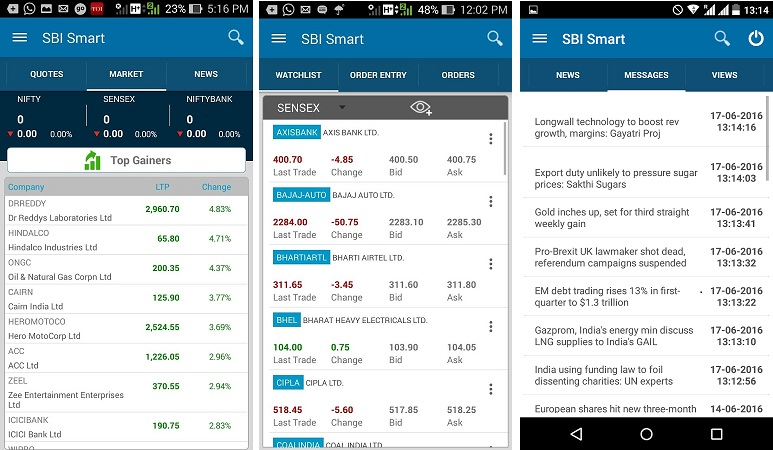 SBISMART Mobile App is an in-house mobile trading app of SBICAP Securities available on Android & iOS. The application is well-designed and has a decent number of features but users might face some difficulties in terms of usability of the application. Listed below are some of the features of SBISMART Mobile App. Mobile App is well-designed and has a decent number of features but users might face some difficulties in terms of usability of the application. One thing that is most important when it comes to research is - Accuracy. And this is the area where the technical tips of this stock broker falter pretty badly. The concern is not only with the performance but with the regularity and the timing of the tips. Either you get these tips too late in order to make a quick profit or you get them once in a while. SBICAP Securities need to pull up its stocks when it comes to research. SBICAP Securities should certainly look forward to increasing the number of communication channels such as web chat, and social media so that clients can have a better number of options to get service on the move. However, as of now, the communication quality is fine and the issue will be more or less resolved in 24 hours. SBICAP Securities is a big name in the share brokerage industry with decent trading tools and a dedicated customer service. But if you are a regular trader, then this stockbroker is definitely not the best choice for you, as you will end up paying huge brokerage in Intraday trading. SBICAP Securites is relying primarily on its State Bank client base; however, it is not a business development strategy. A happy client is a referring client which implies larger business value.